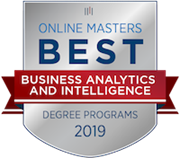 Experience the original online Master of Science in Business Intelligence & Analytics (MSBIA) program, offered by one of the nation’s top-ranked graduate schools. Saint Joseph’s University was the first to connect on-the-ground experts to online MSBIA learners like you. You’ll gain true insider perspective from a faculty of Ph.Ds. at the center of the business intelligence and analytics industry. This program is taught within the Erivan K. Haub School of Business, which is among a small percentage of business schools in the world with AACSB accreditation.